There’s a general belief that homosexuality is still frowned upon in South Africa, especially within black communities. A recent tweet tested that theory in which 2 men were pictured in a passionate embrace. The photo was captioned: “Mr and Mr Tau,” and the tweet went viral as many South Africans had their say. Legit.ng gathered the 2 men tied the knot recently and shared their wedding photos with the world. 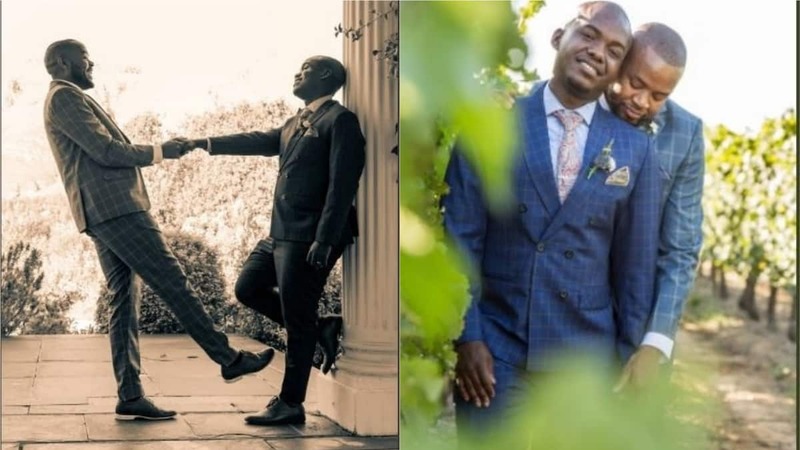 Many tweeps wished the couple well – Kgatishi Danke (@danke_kgatishi) and Bra Lebza (@BadadvocateO) were some of those who congratulated the couple. However, not everyone was impressed and aired their views on homosexuality. Briefly.co.za gathered that the vast majority of comments on the thread were indeed positive and that more and more South Africans have accepted homosexual marriages. Meanwhile, Legit.ng had previously gathered the report that a public relations officer of the Zone 2 police command, Dolapo Badmus, had said that Nigeria is no place for homosexuals. She called on Nigerians to come forward with evidence proving anyone to be gay so that they could be dealt with accordingly.